In addition to matching coupons to sales to get great prices on name brand products, another great idea is to match up manufacturer coupons with store coupons. Yes, you can use 2 coupons on one item, but you have to make sure you are following the rules. You can use one MANUFACTURER coupon and one STORE coupon on the same item. Example: Let's say Zantac (24 count) is $7.59 and the Target brand is $2.49. If Zantac is not on sale and I use a coupon worth $5, the cost would be $2.59. While that is 66% off, it is still slightly more expensive than the store brand. 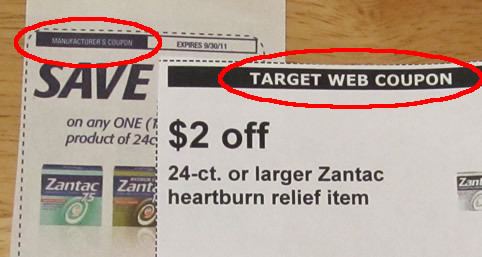 If I also print off a Target coupon for $2 off Zantac, I can use BOTH of them on the same item, for a total of $7 off, making the item only .59 cents. That is 92% off and well below the cost of the store brand. Target recently had Zantac on sale for $6.99 which makes it free with coupons. Given that the expiration dates on the packages were 2015, I say "stock up" if it's an item your family uses! My Free Deal of the Day: Ivory Soap Body Wash 12oz - FREE at Kroger!